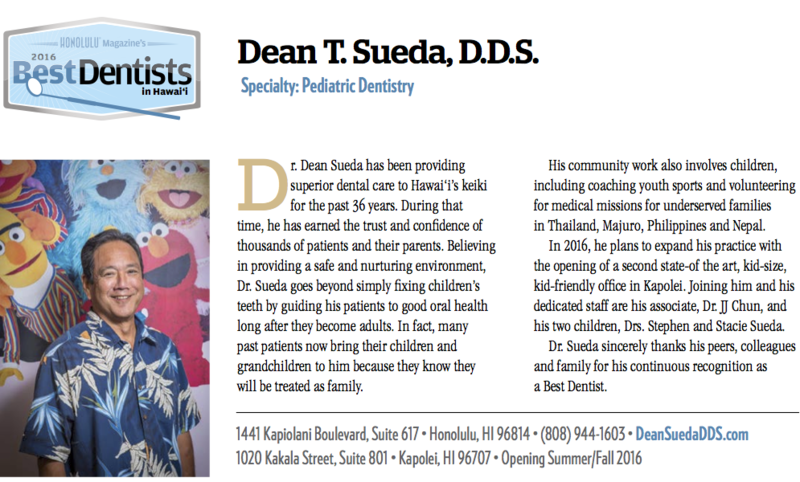 Dr. Dean Sueda has been providing superior dental care to Hawai‘i’s keiki for the past 36 years. During that time, he has earned the trust and confidence of thousands of patients and their parents. Believing in providing a safe and nurturing environment, Dr. Sueda goes beyond simply fixing children’s teeth by guiding his patients to good oral health long after they become adults. In fact, many past patients now bring their children and grandchildren to him because they know they will be treated as family. His community work also involves children, including coaching youth sports and volunteering for medical missions for under-served families in Thailand, Majuro, Philippines and Nepal. 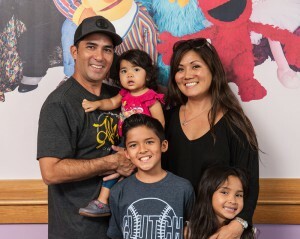 In 2016, he plans to expand his practice with the opening of a second state-of the art, kid-size, kid-friendly office in Kapolei. 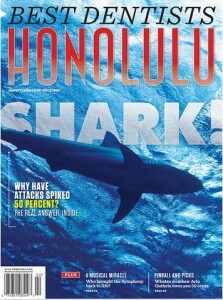 Joining him and his dedicated staff are his associate, Dr. JJ Chun, and his two children, Drs. Stephen and Stacie Sueda. Dr. Sueda sincerely thanks his peers, colleagues and family for his continuous recognition as a Best Dentist. Students Scott Wong, left, and Jazerine Nakamura, right, have moldings taken Saturday to create custom-fit mouthguards as part of HBA Athletic Department’s annual Mouthguard Program. Photo by Deren Oshiro. 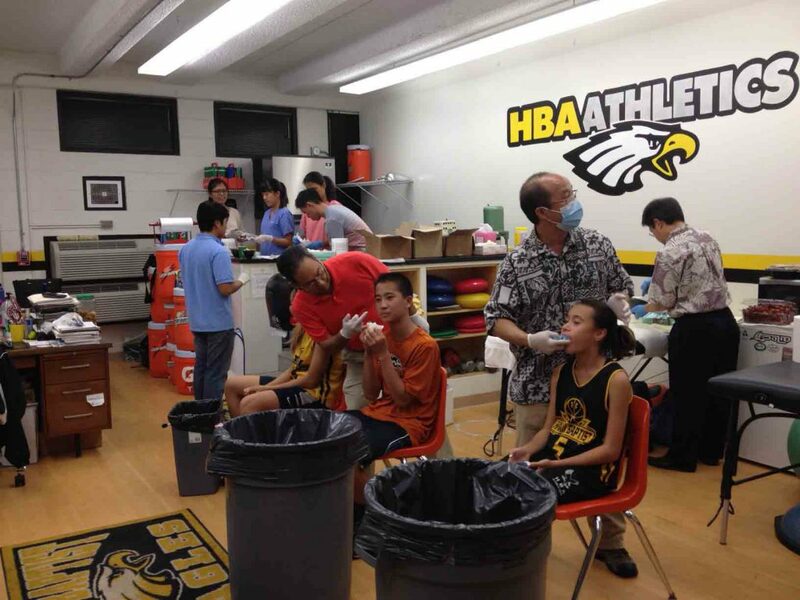 On November 12, 2014 43 students participated in the HBA Athletic Department’s fourth annual Mouthguard Program. The event was once again staged in the HBA athletic training room. The program provides the opportunity to be professionally fitted for mouthguards by dentists and dental students who donate their time and expertise to come to HBA and fit the students. 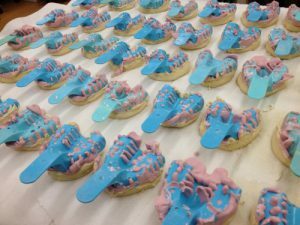 Each student is sized, then a mold is taken which is then used to create the mouthguard. The custom-fit mouthguards are provided by the Hawaii Academy of Sports Dentistry and the entire cost for both the service and the product is only $10 per person. Each student has the choice of ordering their mouthguard in black, yellow, white or clear (the most popular choice this year was clear). The mouthguards themselves will be made by Dr. Melvin Choy, DDS of HASD. HBA athletic trainer Sam Lee initiated the program back in 2011 based on past experience with similar programs at Castle High School (where he was the athletic trainer prior to arriving at HBA). That first year of the HBA program, this service was offered exclusively to students participating in basketball. 59 students participated. Now, over the past four years, close to 200 students have been fitted for mouthguards. The program is completely optional, but highly encouraged from a safety standpoint. According to both of our athletic trainers, Lee and Shannon Keen, some of the worst oral injuries they have seen and treated have been from the sport of basketball. They feel that a mouthguard is a safe, effective and economical tool to help prevent as many painful and costly injuries as possible. And for the oral injuries that do occur, their severity can be minimized through use of a mouthguard. 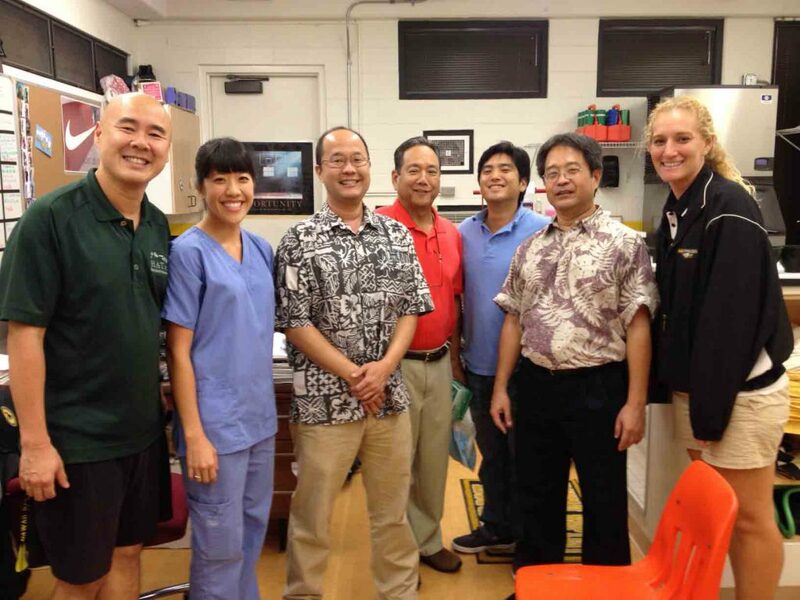 Donating their time to come and serve our HBA students were Dr. Steve Kumasaka, DDS; HBA parent Dr. Dwayne Sakata, DDS (son Bryce, ’18); Stephen Sueda, HBA ’04 and HBA alumni parent Dr. Dean Sueda, DDS (son Stephen, ’04; daughter Stacie, ’06; daughter Stefanie, ’09). Sueda is a pediatric dentist whose children were all scholar-athletes at HBA. Stephen played football, while Stacie and Stefanie played soccer, softball and basketball. Stephen is now completing a dental residency program out in Waianae. We also received help this year from dental students Edwin Tsang, Elise Chong, and sisters Arlene and Ailene Invencion. From left to right: Sam Lee, HBA Athletic Trainer; Elise Chong, dental student; Dr. Steve Kumasaka; Dr. Dean Sueda; Stephen Sueda (’04), dental residency student; Dr. Dwayne Sakata; and Shannon Keen, HBA Athletic Trainer. Photo by Deren Oshiro.